Photovoltaic solar panels will produce energy on cloudy days. Although it might seem counter-intuitive, consider that solar panels on a rooftop in foggy San Francisco produce nearly the same as the ones in nearby sunny Sacramento. Consider too that Germany (with a climate not that different from Vancouver Canada) leads the world in residential solar right now, and it is generally an overcast climate. Fact: Most solar panels are not attached directly to the roof itself, but rather to a mounted railing system. Solar engineers add sealants to fill in any gaps and often the mounts are surrounded by metal coverings that act as an extra barrier from the elements. Solar Myth #5 When the utility grid goes down I will have back up power. Fact: Solar panels are solid state, have no moving parts, do not require regular maintenance and come with a 25 year warranty. Dust and debris can collect on solar modules, but most panel owners never clean the panels and instead rely on the rain to do the job for them. Generally when it comes to snow our recommended action is wait for the sunshine. In Western Montana, grid-tie, net-metered homes make a majority of their solar power in the summer months. Winter power generation is a bonus, rather than a necessity. The days are shorter, the sun is lower and the sky is often overcast. This does not mean that we don’t generate any power, it just means that we generate significantly less in the months around winter solstice. Modules are generally set at an angle that enough snow will begin to shed, temperatures permitting. The cells are of dark colors that promote melting and with enough consecutive sunny days your modules will be generating power once again. Fact: Nearly all modern solar panel systems are connected to the conventional electric utility grid. When this happens, your meter spins backwards and your utility company credits you for that power. This grid-tied method tends to be the most convenient for homeowners. This is ideal for us in Montana, because of our long solar days in the summer and shorter days in the winter time. In Montana the utility company will not write you a check for excess energy that you produce. So generally your system will be sized to accommodate your average annual usage. (determined by your utility bill). Each year the solar electric system generates power during peak season (summer), and you consume power during the darker, shorter days of winter. The utility company (each one slightly different dates) resets once a year and the process begins again. Fact: Solar is a mature technology, and there has never been a better time to install solar. Basic solar photovoltaic technologies have been around for more than 30 years. 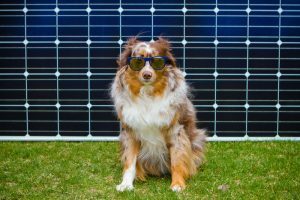 While efficiencies have increased and costs have decreased, the basic solar electric panel is the same solar technology used in the 1960’s and 70s. The solar industry, like other electricity-generating industries, does not evolve as rapidly as the electronics industry has. (unlike computers or cellphones which experience dramatic improvements in short periods of time). When panels become more efficient, it simply means you wouldn’t need as many, because they’re better at converting. Given stable technology profile, a 30% federal tax credit (currently sun-setting in 2019) and a 500.00 per tax payer Montana State Tax Credit, solar is more affordable than ever and makes sense right now. Once installed, the panels are solid state, with no moving parts and have a 25 year warranty. Solar Myth # 9 Manufacturing solar panels requires more energy than the solar module will produce. According to a 2004 National Renewable Energy Laboratory study that analyzes several different panel technologies, “Producing electricity with photovoltaics (PV) emits no pollution, produces no greenhouse gases, and uses no finite fossil fuel resources.” and it takes only 1 – 4 years for the energy savings accumulated by producing electricity from solar to equal the energy cost of producing the panel. Solar technology has improved in the years since this study was conducted, and production efficiencies have driven the “energy payback period” down even further. Solar modules generally have a 25 year warranty and can continue to produce long after that time frame(at a slightly reduced rate) lifetime production of a solar module exceeds far embedded costs. Fact: Solar Panels are durable and can resist golf ball sized hail at 100 mph.. Solar Modules are made with tempered glass like the windshield of your car. Solar panels are solid state, no moving parts and have a 25 year production warrantee. Check out these videos for some great test examples. Solar Myth # 11 Myth: Solar panels don’t work well in cold climates. Fact: Solar panels work with light, not heat so it doesn’t matter how cold it gets outside. In fact, solar panels perform better in cooler temperatures than very hot temperatures. Solar panels are built to withstand varying temperatures, and they can produce electricity from indirect light. Fact: Though tracking mechanisms can provide efficiency gains for your solar electric system, they typically do not increase efficiency enough to justify the additional expense and maintenance of moving parts in residential situations. Generally a shade free, fixed roof mount system is he cost most effective installation.